Christian leaders from around the world gathered in Seoul to talk about the future of Christianity. 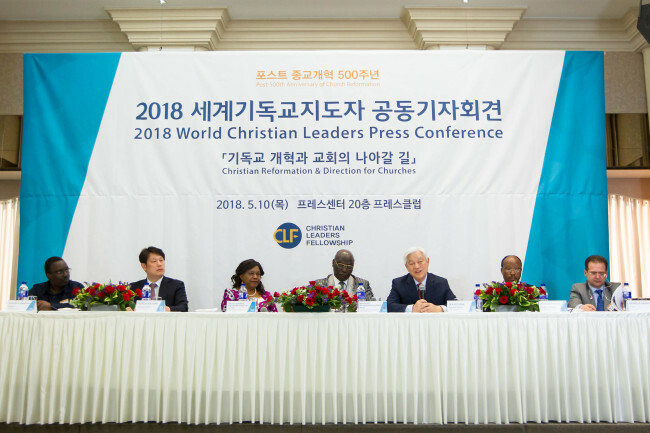 The Christian Leaders Fellowship held a press conference at Korea Press Center in the city on May 10. The organization was formed last year, marking the 500th anniversary of the Protestant Reformation. It is headed by Pastor Park Ock-soo. More than 24,000 pastors from 70 countries are participating in the CLF. At the meeting, CLF leaders -- including Pastor Park Yeong-kook from the Christian Leaders Fellowship(CLF), Pastor Kiseve Arthur Kitonga, president of the Association of Evengelicals in Africa (Eastern Region), and Godfridah Nsenduluka Sumaili, Zambian minister of national guidance and religious affairs -- declared “going back to the Bible” was their ultimate goal. “I am sure that Christianity will get better when we are united and harmonized, even if our religious body and denominations are different,” said Pastor Park Ock-soo. He noted that Korean Christianity is not as glorious as it was in the past, highlighting the need for great leadership. “If Korean churches are united and harmonized, many people will be able to live happy lives together,” he added.